Many of you have skills on different programming languages. 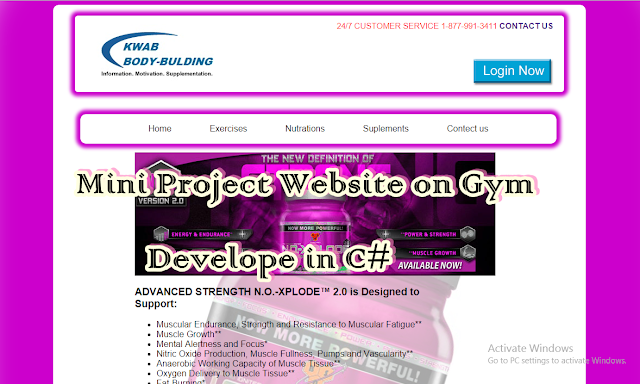 To develop a website in ASP.NET you must have skill on C# language and it’s concept to develop a full web base system. For front hand you should be highly expert in html, css , java script languages. To make it interactive for end user. Beginner in computer science field learn programming in different way , many of them learn by reading and understanding someone codes and then customize its own self or make it workable for your own. Here in this post you can download a Website with source code given complete develop in C#, html, css and java script language. Many of you assign a mini project that you have to submit to your teacher for their subject in Bachelor level. For those who are learning Internet Programming subject is a good practice for them. You can download this project as a sample and make a different website by this project idea. Students who are doing study in university for them this is a miniproject idea. This website have following feature in it. Home, Exercise, Nutrition’s, Supplements, Contact us. Social links, Login form, feedback button for User. Different games exercises. After this extract the project into your desktop by FILE Compressor software. And navigate to this project file. Run it and you can see an interactive website which is local host on your computer and working.